‘Tis the special season, when houses and stores are decorated in lots of red and green, when yuletide music is in the air, and when I think of Christmas visits by a Sharpsville Santa Claus to our home in the 1950s. Now that I live in southern Arizona, where the weather is warm and sunny at Christmas, it takes the appearance of those decorations and music to remind me that it’s even December. Here, instead of hosting Santa visits, one of our family traditions is an evening at Las Noches de las Luminarias, presented annually by the Desert Botanical Garden. We stroll pathways lined with luminaria bags and towering cacti adorned with twinkle lights while serenaded by a wide variety of musical groups — from handbell ringers to jazz to mariachis — along the way. 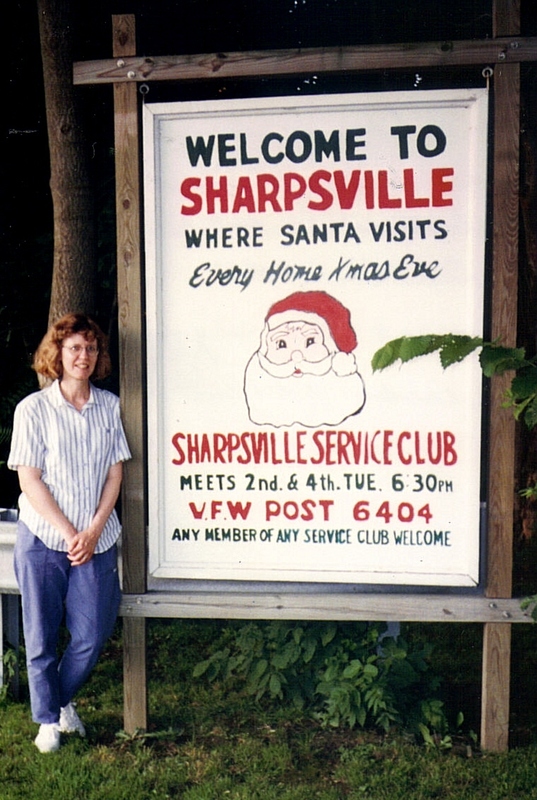 On this blog site last year Judy McCracken (SHS 1960) wrote of her fond memories of visits by Sharpsville Santas in a narrative titled “A Sharpsville Christmas.” The following is another recollection of that beloved tradition. “Welcome” sign at entrance to Sharpsville on Sharon-Sharpsville Road, 1993. How can memories of Sharpsville, Pennsylvania, not include Santa Claus visits to our homes on or around Christmas Eve! Is there any other town in the United States that has supported such a delightful program with such regularity for so many years as Sharpsville has for 66 years?! This annual tradition began in late 1948 at a Sharpsville Service Club meeting when George F. Mahaney Jr., a local lawyer, told his fellow members about a Christmas custom in his own neighborhood. For several years on Christmas Eve, he and a friend donned Santa Claus costumes and paid calls to families with children. He suggested that this project be expanded to cover the entire borough of Sharpsville. The idea was adopted and implemented that very year when approximately 10 volunteer Santas hit the streets the night before Christmas. Since then the project grew to involve 40 Santas by 2001. Not only have some members been Santas for over 20 years, succeeding generations of the same families have also been Santas to succeeding generations of children. It works like this: Before the eventful night, dozens of volunteers spent hundreds of hours recruiting participants, providing supplies, planning routes, coordinating activities, making popcorn balls, and alerting residents to turn on their porch light if they wish to welcome a Santa into their home. A door-to-door Santa shares a popcorn ball with Pat Angel at his home on Second Street, 1955. Helpers drive the cars and keep one house ahead of Santa to tell parents of the impending visit and learn names and Christmas wishes of the children. If parents want Santa to deliver a gift to their child, they leave it on the porch. I warmly recall those stops at our house on Second Street during the 1950s, announced by the jingle of bells and a resounding “ho-ho-ho.” I was a teenager who felt too “grown up” to join the fun, but I took great pleasure in observing Santa’s cheerful interaction with my two younger brothers. Even though the Service Club members knew they needed to be “ready for anything” when they entered a home as a Santa, they have described the experience as rewarding and uplifting when they saw the excitement and wonder on the faces of the children. The visits must have indeed inspired happiness in the hearts of young and old alike and the hope that this simple but meaningful community tradition would be around for future generations to enjoy. Besides recording my own memories of the Santa visits, I used information from the following sources. You are welcome to send in corrections, additions, or your own recollections. “Jolly volunteers head out every Christmas Eve; Sharpsville kids guaranteed visit from Santa,” Feb 4, 2001 – Indiana (PA) Gazette, February 4, 2001. “Santa really visits every home in Sharpsville,” Observer-Reporter (Washington, PA), December 2, 1981. “Sharpsville: It takes more than eight tiny reindeer.” The Herald (Sharon, PA), Dec 26, 2000. “What’s it like to be Santa?” by Joe Zentis, staff writer. The Herald (Sharon, PA), December 26, 2000. “Where Faith Defies Reality.” In a December 2004 Herald essay, Mary Claire Mahaney shared memories of her uncle, George F. Mahaney, who inspired the idea of Sharpsville’s Santas and worked as one when she was a little girl. Sharpsville Service Club Facebook page [no longer in operation]. 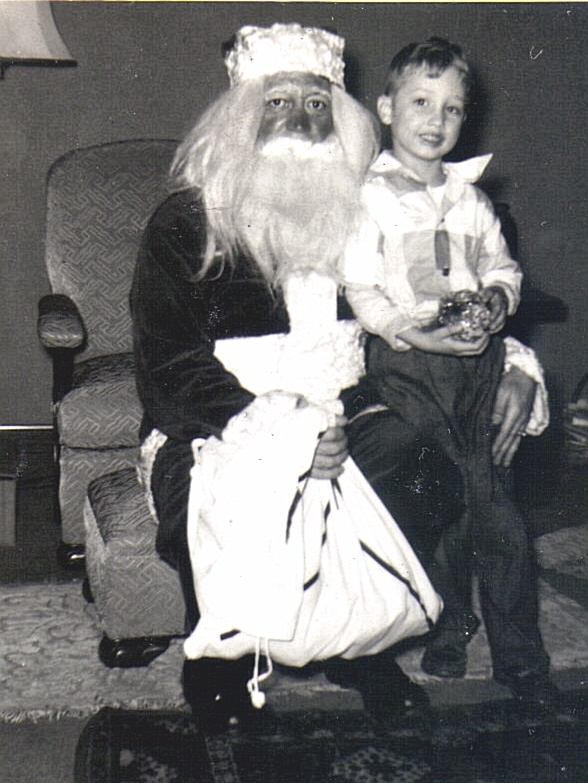 My father, Leo Haspel, was a Santa driver for years. Our house was always one of his Santa stops. I can remember Santa at the front door, holding Christmas presents, while my father was behind him winking at me, my brother, and my sister. That was a wonderful service to the Sharpsville community! I agree, Darla. Those were happy times.